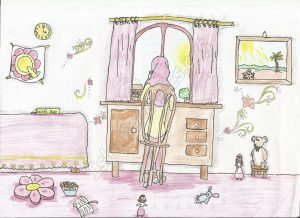 Here’s a nice Islamic illustration by my daughter Yusra of a girl in hijab reading a book. Yusra is really into exploring her talents in Islamic Manga these days. Here’s a lovely little picture by her of a little Muslim girl enjoying the outdoors in the evening. Here’s a cute illustration of a Muslim girl sitting at her work desk in her room. 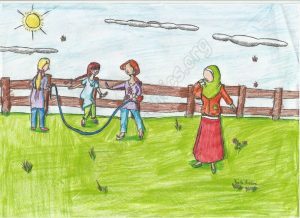 Here’s a colorful Islamic Illustration by Yusra, Age 9, of three lively girls playing jump-rope in a field, but someone feels left out.